Innovation management is not a replacement of human creativity. It is an addition, that provides the fertile soil for the seeds of creativity and ingenuity. In a previous post, I went through several patterns of failing corporate innovation. In most of the cases it fails not because of bad ideas but because of bad organizational support. Opportunities are killed either too early — before they showed real potential; or too late, burning huge amounts of money. A Business Unit should operate the current business but should also try to disrupt itself. The resources are shared between existing business and Innovation and the existing business overpowers the innovation. The eagerness to explore new technologies and the fear that a new technology might eat the old business. The desire to have new products and the fear to experiment with customers because an unfinished product might damage the brand. Put Stage-Gate approval process, but both the approvers and the approved are biased to look more successful than they are. Incentives are based on execution not learning and validation. In this post, I will describe several innovation functions that add balance to the forces listed above. They are part of a framework that should counteracts the biases, group decisions, and wishful thinking, and will provide metrics for management decisions. This framework was inspired by the Geoffrey Moore’s book Zone to Win and the work of thought leaders like Steve Blank and Eric Ries. The following diagram shows the necessary components and work flows of a successful Corporate Innovation system. It is not an implementation diagram. These functions could be implemented in different ways but missing some of them or having them out of sync will lead to failure of innovation. Let’s start with the most important function. The Portfolio Management is a balancing function between the old products and the new development. It coordinates the value propositions for the whole company or a market segment. It is on top of both the existing Business Units and the Innovation functions, providing the balance in the portfolio between the profitable existing solutions and the innovative products of the future. 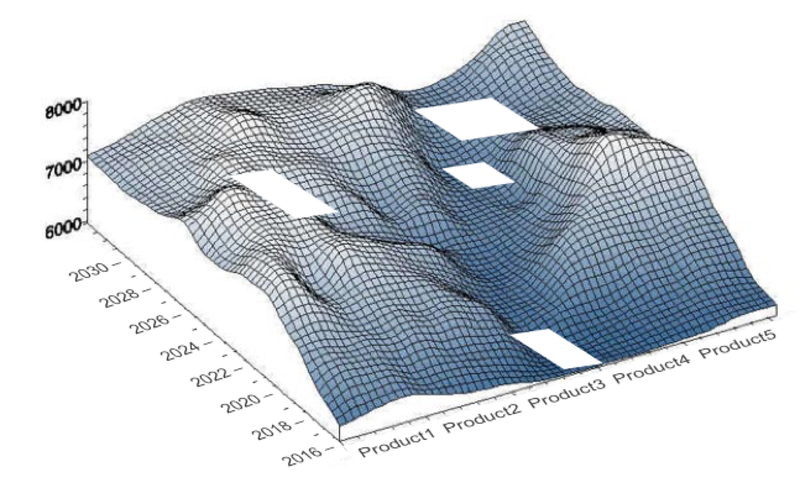 The portfolio could be figuratively visualized as a terrain map representing the current and future products. It should help in identification of gaps and market threads. The Portfolio also enforces the mission and the strategy of the company. It puts the boundaries of what the company does and does not. What should be delivered and what should be explored. Without a consolidated portfolio, the innovation activities become random and unfocused. It is a hands-on activity done by one person or small committee, which actively steers the products life-cycles of different offerings. The Portfolio Management works with the Business Evaluation team on prioritizing the Opportunity List. The most promising features or ideas are selected for development. The Portfolio Management offers the opportunity to an existing Business Unit, or to a new incubation team. This is decided case by case, depending on the strategic and tactical goals of the company. A simple framework for deciding which unit takes which idea is discussed here: here. The Portfolio management can pull back a feature (in some cases also the associated the budget) from a team if it is not delivered in time. There can be also set limits on Work In Progress, so a team can work only on few features at the same time. One of the most critical roles of the Portfolio Management is when a core product faces external disruption. We’ve seen how companies in the past reacted to disruption. It unlocks all kind of protective mechanisms, which seen from a distance look unreasonable, short sighted and counterproductive. We’ve seen how the Big Core Product switches to all-around defense turning down all other ideas. Eventually killing the offsprings that could have saved it. The Portfolio Management should be able to provide timely and reasonable transition between the old and new offers. Turn the thread into opportunity. Protect the company from external disruption by replacing the old products. Develop capabilities with the new technology, starting from the lower end of the market. Provide smooth transition between the old and new solution, by shifting the product positioning and gaining maximum market share. Steering the market segmentation between the big customers and the early adopters assuring big enough gap between them. Responsible for assuring there will be revenue from new products. For example 15 % of the revenue should be from products developed in the last 3 years. Prioritizes the Opportunity List together with the Business Evaluation and Strategy teams and selects projects or features for development. Decides which team will get the offer for the opportunity or starts a new product team. If results are not delivered in time the Portfolio Management can take back the opportunity from one team (BU) and give it to other team. Manages market segmentation to prevent direct competition between old and new products. The new products should go to Early Adopters, while the old continue to the established customers. The new product could slowly replace the old, balancing between profitability and competitiveness. Oversees the development and market adoption of incubation projects and decides if it should continue or not. It is responsible for the products of tomorrow and the future revenue. It is a powerful internal customer creating pull, setting direction and adding time pressure. It demands sellable products from the BUs. Outcome-oriented — not activity oriented. Single place of responsibility and decision for the main phases of the product life-cycles. Counteracts the games of power of the existing BUs. Protects the existing BUs from the need to disrupt themselves. A good portfolio has a balance between current and future products. It consists of products that reinforce each other. Not a bunch of silos, but an ecosystem, whose value is bigger than the sum of its parts. You can find examples of such ecosystems in the portfolios of Amazon, Google, etc. On the other hand, there should be loose dependency between the products, the opposite will decrease their agility and delay the development of each element. This fine balance should be assured by the Portfolio Management function. The Incubation Function is the home of the Incubation Projects. Each project is responsible for growing a new business from scratch. Find a product that the customers want to buy by evaluating which features the customer values. The biggest risk is to build something that nobody needs. Find a profitable and repeatable business model for delivering the product to the customers. The risk here is to implement wrong or old business model that is not applicable for the current market. The Incubation function follows the best practices of the Lean Startup methodology and the Agile product development. The teams in the Incubation Function experiment with different business models and product features and measure the market reaction. They work directly with end users, starting with the early adopters and growing a new market. The projects in the Incubation Function consists of Software developers and Customer developers. Looking for the Desired set of features of a new product by developing Minimal Viable Products. Looking for a better business model, leveraging the benefits of the available technology or resources. Engaging and validating with early adopters. Developing products that might be disruptive for the old BUs. In order to achieve their goals, the Innovation teams can work with R&D or Technology acquisitions, to speed up the product development. The success of the incubation project is measured by the Customer Traction function. Acceleration function is responsible for the Productization of the new solution. Once a viable solution for a problem is validated with early adopters it is time to scale it up for the mass market. Improving the backend operations — removing frictions, increasing efficiency, adding suppliers. Implementing the new sales model in the sales organization. Creating a strategy for co-existence with the existing products. Or the transition from the old to new products. This should be an iterative process with regular validation with customers and partners. In case of success the Accelerated project is NOT merged into the old Business Unit. It grows to a separate business unit. The Portfolio manager is managing the market segmentation between the old and new product, assuring the transition to the new solution. People from the old BU are trained and transferred to the new team. The Incubation function is on a quest. So this function should be staffed with curious adventurers. Their incentives should be different than the execution functions. It should be similar to the incentives in the Startups. Can we use the existing Sales department in incubation? In most of the cases — No. The Sales department executes and improves a validated business model at scale. This model has known parameters and variables. The new product requires a new business model. It should be defined and validated by the Incubation Function. Once a repeatable model is identified it will be transferred to the Sales department for execution. The Traction Control function (TC) is responsible for setting and assessing the right metrics for customer adoption. It consists of Customer Development experts. They consult the new projects how to set the right goals, and what metrics should be collected. Later in the development, the TC function audits the collected metrics and reports to the Portfolio manager. Each Incubation project will have different and frequently changing goals through its lifecycle. It is usually hard for the management to keep track on the specific metrics for each project. The Traction Control function helps the top management in making informed decisions. The traction report could be used for budgeting of the incubation projects. There could be a coefficient of customer traction that translates to budget money. In time this coefficient decreases, as the project starts to collect revenue from paying customers. The R&D team is different from the SW development team in Incubation. The goal of the R&D team is to develop knowledge about new technologies. It delivers the knowledge in the form of patents, instructions, use cases, PoC, insights, etc. The R&D projects do not automatically grow into incubation projects. If there is a potential in a specific technology, the R&D team should put in the Opportunity List for business and strategy evaluation. The Portfolio Manger could approve it later for development. The goal of this function is to provide the understanding about the customers. It is really focused on the customer. Not a market research for a specific product, but researching the evolution of the customers — their expectations, needs, trends, etc. The customer of tomorrow is different from the customer of yesterday and we have to know how and why. What are the customers using — is the microwave with a touch screen or voice control. How many devices they carry. How they learn, or entertain, how they interact with friends or brands? This will be the main source of insights in the Opportunity list. The communication between teams is crucial for the Corporate Innovation. There should be regular (weekly) meetings between the customer facing roles and the technical teams, around different opportunities. The existing business units should continue doing what they are doing best — delivering value to the customers every day. The innovation in the existing products should be mainly (but not limited to) incremental, based on the customer insights, efficiency, and technology advancement. The existing business should be competitive and adequate to the customer needs, for example by running a continuous improvement program. In order to fulfill its role, it should be an organic part of the company portfolio. To overcome the natural conflicts of interests between the old and new business there should be a single decision body responsible for current and the future businesses and the fit to the company strategy. This is the Portfolio Management function responsible to deliver a certain percentage of the revenue from new products. It should be balancing the opportunities, the budget and the market segments between the existing and new business. This also means taking out some power from the existing business units for the benefit of the company. It should have strong executive support or be fulfilled by an executive leader. The Incubation function is developing new business models, validating real customer needs with early adopters. It needs to have end-to-end responsibility for the product development and the market positioning. It could follow the Lean Startup Methodology and Agile development principles, iteratively developing new features and getting feedback from early adopters. The profitability should be tested as early as possible, as part of the Incubation and Acceleration phase. These are some of the functions in the corporate innovation system. This is not an organizational diagram but rather a flow chart of the innovation system. The actual implementation depends on the goals and the organizational setup of a company. Can you suggest other functions that could improve innovation system? Please let me know in the comments how is the innovation system implemented in your organization? What helps and what stays in the way? PS. I intentionally didn’t mention the corporate culture (and its breakfast habits), as the culture is an outcome not an ingredient. Here is the Part Two of the article. Happy to connect with you on LinkedIn.